The Mission of the North Hollywood North East Neighborhood Council is to promote and to empower public participation in government and to encourage government to be more responsive to local needs. The North Hollywood North East Neighborhood Council shall include representatives of the many diverse interests in the community and shall have an advisory role on issues of concern to the neighborhood. 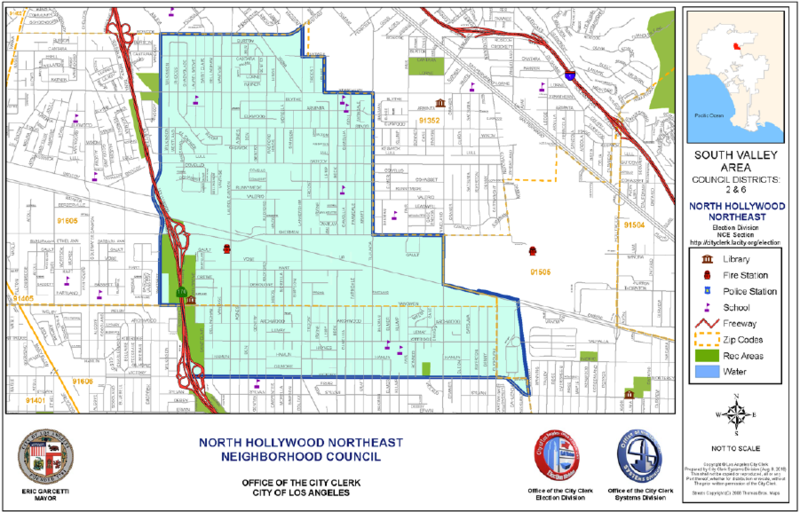 The North Hollywood North East Neighborhood Council is one of 99 local councils in Los Angeles. The Neighborhood Council system was created in 1999 to provide a better link between local neighborhoods and City Hall and help make government more responsive to communities. Our own Council was certified in 2002 and has been working for more than 10 years. Our purpose is to provide a forum for community discussion, monitor and improve City services in our neighborhood, and provide a greater voice for us to speak to City Hall. The Neighborhood Council was created to serve and represent our stakeholders. A stakeholder is not only a resident, but also anyone who works, owns property, or has a substantial interest in our area. That includes parents and children, business owners, teachers, charitable groups, and more. Our governing board is made up of our stakeholders and is responsible to them. We want to use our influence to make the City more responsive to your concerns. We want to keep you informed and involved in the rules and regulations proposed by the City – and offer our community feedback on what those new rules should be. And we want to offer you a place to be part of the neighborhood. The Neighborhood Council is goverened by a Board of 15 elected stakeholders. Any stakeholder over 18 is eligible to serve as a Board Member and any stakeholder over 16 is eligible to vote. Board Members serve four year terms and elections are held about every two years. Vacant seats between elections can also be filled by a vote of the Board. The Board decides the policy of the Council including our recommendations to City Hall. The Board also allocates a small amount of funding to support community groups and events in our neighborhood. Make a public comment at one of our meetings. Please bear in mind that the Board can only take action on items on the agenda. If you would like to ask that an item be agendized you must contact the president or committee chair at least a week in advance of the meeting for consideration. Supported with a moderate amount of City tax-payer money, Neighborhood Councils have approximately $42,000 yearly to spend at their discretion. Typical areas of expenditure include outreach and administrative support, youth and school support, neighborhood improvement projects, community-based events and activities, emergency preparedness, and park and landscape beautification. Organizations seeking support should complete the Application for Neighborhood Purposes Grant and submit it for consideration.